Have you noticed the music of Charlie’s Brooker Weekly Wipe? It’s a lovely theme by one Nathan Fake which captures the perfectly appropriate ‘twisted newsiness’ vibe. Take a listen. There’s a little moment at the end of the theme that seems to pull the auditory carpet from under your ears. (at around 0:26). Well, we humans are excellent at gleaning a pulse from a piece of music, that’s to say a time subdivision which a sufficient number of important musical events satisfies. Our sense of pulse is related to how we might clap or tap our feet along to music, it’s based on mathematical principles of prediction but for many of us it’s a perfectly natural, innate skill. Now a pulse can be further split into various levels of ‘subdivision’, and pulses may also be grouped in at various ‘higher levels’ of rhythmic organization given rise to the phenomena ‘meter’, ‘beat groups’ and so on. Our ability to group (and regroup) rhythmic events can be exploited for expressive gain and/or musical surprise. In Weekly Wipe, there is a pulse sensation of 192pm grouped in 3s (1, 2, 3) with hihats occurring on beats 2 and 3 and a repeating melodic motif, that splits these 3 beats into 6. 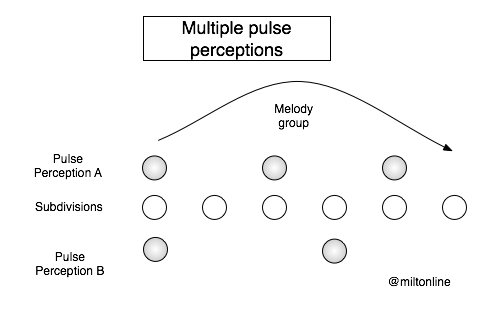 So we can see the melody group as cycles of 6 beats, with an underlying pulse of 3 sets of 2-subdivisions (see Pulse Perception A in the top portion of the diagram). What happens at 0:26 is that the melody suggests a different grouping of subdivisions. The 6 subdivisions (which were previously split as 3 sets of 2), is regrouped into 2 sets of 3. 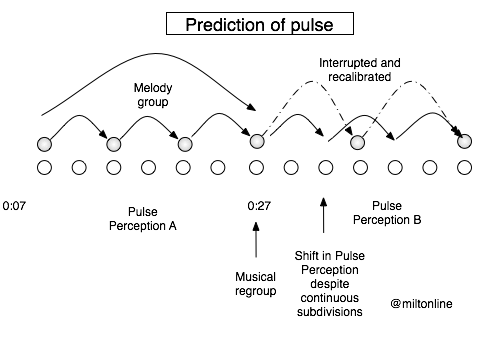 (See Pulse Perception B on the lower portion of the diagram). It sounds disruptive because our predictive faculties are forced to recalibrate soon after 0:27 when are expectations of another 2-subdivision group is extended to 3 members. The tempo doesn’t change (in fact the original accompaniment continues albeit quieter) but our experience has shifted. Sometimes regroupings can lead to tempo changes whereby the pulse is reinterpretated to make sense of the groupings. This is known as metric modulation. (See Elliot Carter, Bill Bruford’s Earthworks and many others for examples). The effect in Weekly Wipe is not a tempo shift but certainly surprising, particularly to find such a technique in a theme tune.